Contrary to popular beliefs, finished military products are not Russia's only global military offering. The country is also a major exporter of technology. Moscow sold more than $12 billion worth of weapons on the international arms and military equipment market last year. However, finished products are not Russia’s only global offering. The nation also exports technology for other countries to use in establishing manufacturing of their own. Russian-made RD-180 engines for medium-sized space rockets have triggered a large-scale investigation by U.S. anti-trust authorities. 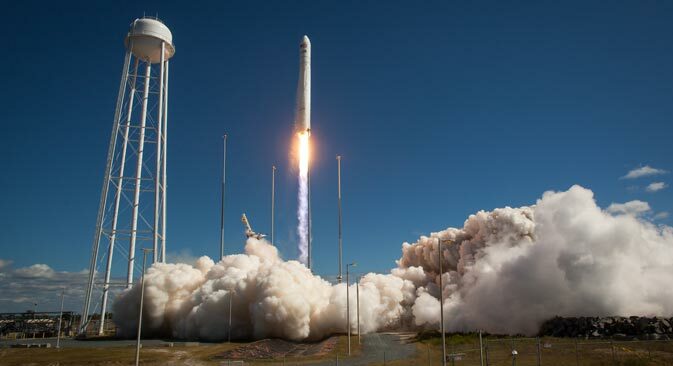 Two U.S. companies — United Launch Alliance (ULA) and Orbital Sciences — quarreled over the right to purchase the engines powering the Antares rockets, which fly missions as part of NASA programs from Russia. United Launch Alliance is suspected of illegally blocking its rival’s access to mission-critical components from RD Amross, a joint venture between the Russian company NPO Energomash and the American company Pratt & Whitney Rocketdyne. The former manufactures the RD-180s, and the latter supplies them to ULA for use in their Atlas rocket carriers. As Russia is reproached for supplying products that are allegedly not very hi-tech or modern, a dispute for access to Russian space technology between two major U.S. aerospace firms shows that those allegations should be taken with a grain of salt. Despite what competitors have to say, it is obvious that interest in Russian technology comes not only from developing countries. France, for one, has expressed interest in Russian rocket technology. The French were among the first to order a vertical launch system for their ship-mounted, anti-aircraft missile system Crotale Naval from the Russian PD Grushin Machine-Building Design Bureau. Thanks to Russian know-how, the S-300/400 missiles, which serve as the basis for the French system, launch vertically from their containers and, once airborne, are guided toward their targets using radio signals. This sharply reduces the time needed to respond to threats by almost six times. Western-designed models, on the other hand, need their launchers turned in the target’s direction. In addition, the Russian technology completely eliminates any “dead zones” in defense through which enemy missiles could penetrate. Neither the U.S.-made PAC-3 Patriot anti-aircraft missile system, nor the future THАAD tactical missile defense system has such capabilities for now. The United States is only just developing a hi-tech, medium-range, surface-to-air missile in cooperation with Italy and Germany (codenamed MEADS for Medium Extended Air Defense Missile Systems) that is similar to the Russian one. South Korea, on the other hand, went to Russia directly and has already created its own anti-aircraft missile system, Cheongung MSAM, featuring vertical missile launch. There are other examples where companies in the aviation industry have borrowed Russian technology. Moscow and Kiev have been unable to sort out the fate of their joint military cargo plane project, An-70, for 15 years now. Its uniqueness stems from its D-27 two-shaft propfan engines, which allow aircraft use shorter runways. Dating back to the 1980s, the never-implemented Russian-Ukrainian technology formed the basis for the European program of the future cargo plane FLA, which subsequently transformed into the А-400М military cargo plane totally identical to the An-70. A similar story happened with the Italian М-346 Master combat training plane produced by Alenia Aeromacchi. The Italians obtained its design documentation from the Yakovlev Design Bureau in the early 1990s, as part of a debt settlement. Now there are two similar machines in the world — the Russian trainer Yak-130 and its exact European clone, the М-346 Master. Whatever the case, the above examples demonstrate that the military and technical potential of Russian firms is not so far behind the United States or Europe. There are areas where Moscow is ready to borrow technology (such as optics or electronics), but there are also areas where it is prepared to share its expertise with foreign colleagues.